When you experience a dental emergency – whether as first responder to an injured child, or as accident victim – it may be important to administer basic first aid before seeking emergency treatment. An abscess is a severe oral infection that can occur in the teeth or gums. This type of oral infection can enter the surrounding bone and tissue, and spread to the brain and other parts of the body via the bloodstream. Bacterial abscesses are potentially life threatening if widespread infection of the brain and body occurs. Symptoms: Throbbing, painful toothache/jaw ache; hot/cold sensitivity; fever; facial swelling; sensitive lymph nodes; foul odours from pus (released during abscess ruptures). Seek immediate emergency dental treatment. Rinse mouth regularly with warm salty water until dental or medical treatment is accessed. Maintain good oral hygiene and care. Moderate pain can be managed with over-the-counter medication. Cold compresses can help alleviate swelling. A bitten tongue, lip or inner cheek can be the result of eating or an injury. Symptoms: Bite area may be red, sore, swollen or infected. Clean wound with clean water. Mouth rinse gently with lukewarm, salty water (½tsp of salt to 1 cup of water). Once bleeding stops, ice/cold compresses can be applied externally to affected areas to help reduce bruising, swelling and pain. Call your dentist for advice or treatment if wound gets infected. Bleeding from the tongue, lip or outer cheek that is the result of an accidental bite, cut or graze. For external wounds, apply clean dressing and maintain steady direct pressure on the wound area for several minutes until bleeding has stopped. Ice can be applied to reduce swelling. If bleeding cannot be controlled, seek emergency treatment or contact a medical professional. 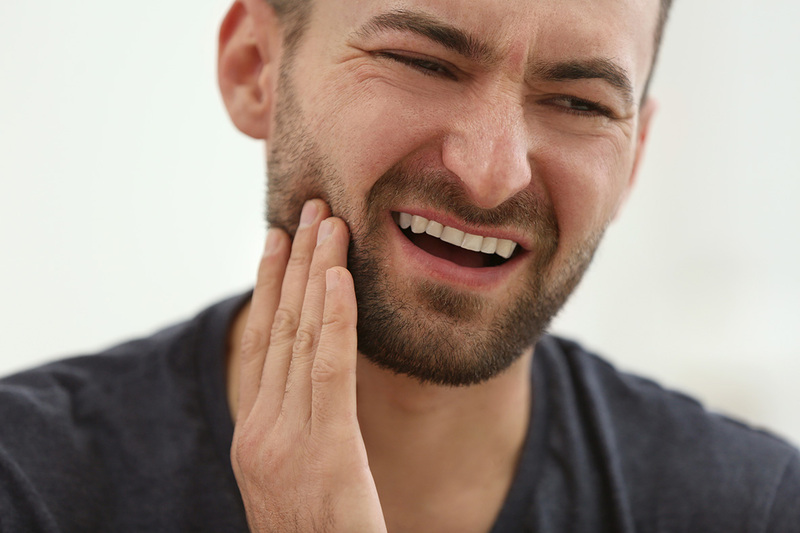 Jaw pain may be experienced for a range of oral conditions including teeth grinding, Temporomandibular disorder (TMD), injury, abscesses and gum disease. Pain symptoms: Increasing pain over time – from mild to severe; sudden acute pain. To relieve pain temporarily, place a cold compress over the affected area. Use over-the-counter anti-inflammatory pain medication. Seek dental or medical assessment and treatment promptly for your chronic or acute jaw pain. Symptoms: Sudden acute and continual jaw pain; swelling of jaw; breathing difficulties; numbness of lower lip or chin; upper and lower teeth don’t meet in a bite (malocclusion); difficulty moving jaw to speak or yawn; intra-oral bruising & bleeding; misaligned teeth. If you suspect a fractured jaw, avoid any movement of jaw. A scarf may be tied around head and jaw to prevent jaw movement. If patient has symptoms of a jaw fracture, call a medical doctor for advice, or proceed to the Emergency Room of your nearest hospital immediately. You can save a knocked-out permanent tooth, but it requires action within an hour of losing the tooth. If the knocked-out tooth is a baby tooth of a young child, a dentist will usually not attempt reimplantation to avoid potential damage to an emerging permanent tooth. Locate the tooth. Handle by holding the crown only. Avoid touching the root and do not disturb any connective tissue fragments. If possible, rinse dirt or debris off the tooth with milk or your own saliva (if it’s your tooth). Don’t use water. Try to replace the tooth into the socket. You can also place the tooth in the mouth and hold it between the teeth and cheek pouch. For young children, keep tooth immersed in milk or saliva (not water), or wrapped in plastic film. DO NOT ALLOW TOOTH TO DRY OUT. It is important to keep the tooth moist to improve the chance of a successful reimplantation. Emergency Room of your nearest hospital immediately. Tooth concussions occur when a tooth has been knocked on or impacted by a moderate force that does not result in any tooth displacement or tooth intrusion. Tooth concussions usually affect tooth ligaments, and the blood and nerve tissue that connect to a tooth’s root. Concussion injuries may result in some temporary bruising and tooth discolouration. Symptoms: Tenderness; bruising; tooth discolouration. Minor tooth concussions do not require emergency treatment, and usually heal naturally. Avoid use of the affected tooth during hard bites on food. If the tooth starts to darken in colour, contact dentist. Tooth displacement may occur following oral trauma. The tooth is usually still attached to the socket but may protrude at an odd angle or extrude partially from the socket. In the case of a young child, tooth displacements of baby teeth can usually self heal. 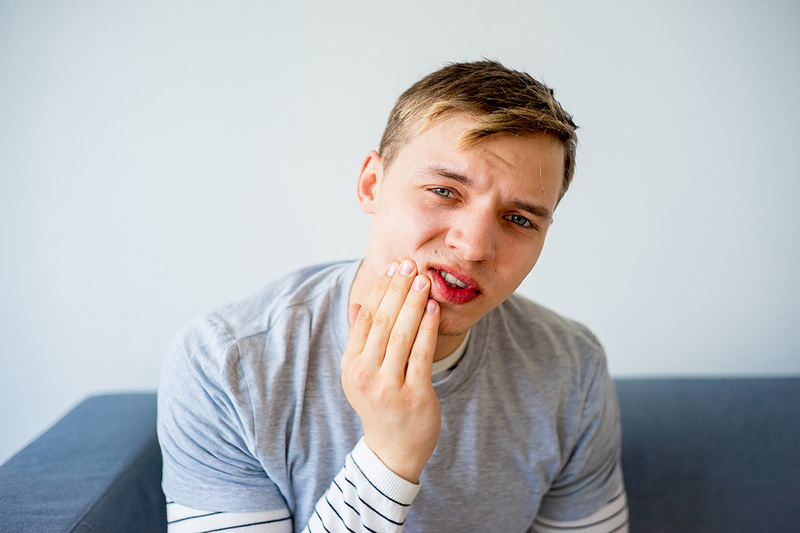 Displacement of adult teeth (permanent teeth) is a more serious issue, and dental treatment should be sought promptly to avoid potential tooth loss and oral infection. Symptoms: Tooth is in an unnatural angle or position; tenderness; tooth pain; bruising; bleeding; tooth discolouration. Place ice/cold pack on face over affected area to control swelling. Use over-the-counter pain medication to relieve pain. Contact dentist, or proceed to Emergency Room immediately – if injury is severe, and bleeding cannot be controlled. In this more serious type of tooth displacement, a tooth or teeth has been forced or driven into the jaw bone due to an impact. In mild cases, the tooth may descend back to its original position naturally as long as good oral hygiene is maintained, and soft food is eaten for at least a week. In severe cases, the tooth’s supportive ligaments and socket may be damaged. 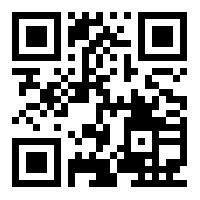 Symptoms: Sunken tooth, tooth pain, bleeding. Rinse mouth with cold water. Contact dentist or proceed to Emergency Room immediately. The visible part of a tooth is called a crown, and is most susceptible to trauma. Depending on the severity of trauma, immediate treatment may or may not be necessary. Minor fracturing of the tooth enamel may only require a dental sealant, whereas severe fractures that expose the tooth pulp require immediate treatment. 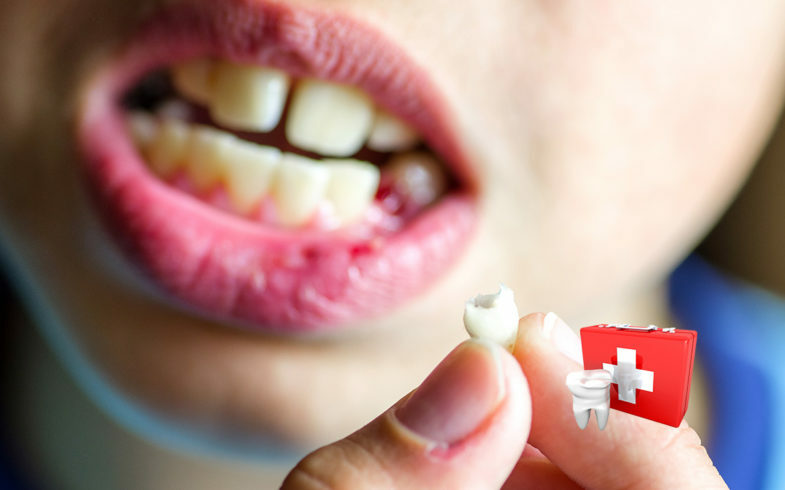 If an exposed jagged edge of a fractured tooth irritates the tongue or inner cheeks, oral inflammation and infection may result – so cover affected tooth with a clean biocompatible material, such as a cotton ball, to prevent oral complications, and gently hold in place with a half bite. Symptoms: Affected tooth has different shape; pain when chewing; teeth feel different against tongue or inner cheek; intermittent/fluctuating pain; hot/cold sensitivity. Place ice/cold pack on face over affected area. Contact dentist for advice, or proceed to Emergency Room immediately (if injury is severe). A root fracture/vertical root fracture is usually caused by oral trauma, and may only be visible above the gum line. X-rays are usually required to identify the suspected fracture. Vertical root fractures are very serious, and tooth extraction may be the only viable treatment. Fracturing may be caused by excessive pressure placed on tooth. Jaw fractures are more common in people aged over 40, with teeth weakened from having undergone extensive non-conservative dental treatment. Symptoms: Visible fracture lines near gum line; tooth pain; bite pain; hot/cold sensitivity. Contact dentist or proceed to Emergency Room immediately (if injury is severe). If you lose or fracture a dental crown, the resulting open cavity may affect your tooth nerve, and expose your inner tooth to food debris and bacterial infection. Symptoms: Loose or detached filling or crown. Remove detached filling or crown from mouth. Use a temporary filling to reseal and protect your tooth from bacteria. You can clean the underside of the original crown (if wholly intact) and reattach with dental cement, bought over-the-counter from a pharmacy. Alternatively, use dental wax to fill and seal the open cavity. See dentist as soon as possible. Toothaches are caused by irritation of the tooth nerves, and occur for a number of reasons. Risk factors include gum disease, tooth decay & cavities, plaque, cracked/fractured teeth, emerging wisdom teeth; displaced/knocked-out teeth; post-extraction, tooth grinding and abscesses. Symptoms: Intense tooth aches and pain; hot/cold sensitivity; bleeding or discharge of pus; swelling; injury; trauma. Avoid hot and cold food or beverages. Avoid sweet acidic foods and beverages. Keep body in an elevated position. Use over-the-counter pain medication for temporary relief.